Left Only two babies left out of a clutch of 6. Died of yeast. Right Same two, 2 weeks later doing much better. Both birds are very happy and healthy today. Removal to a strange new place is a traumatic and stressful experience to a baby cockatiel. Because of this, place your new bird in a quiet place for at least one day before you start handling or training it. This gives it time to adjust to its new surroundings. Watch it carefully to make sure it has found its food and water dishes and is eating and drinking. If you have a scale appropriate for weighing your bird, try to weigh it every day and make sure it's total weight does not drop more than 10%. 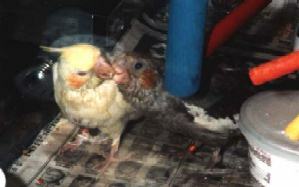 If you have other birds your baby should be placed in a separate room from other birds for 30 - 45 days quarantine. Cockatiels are very social birds and bond very strongly to their owners. Spend as much time as you can with your bird. The more you have it out of the cage and with you the more it'll want to be with you. For more history of Cockatiels view Australia's maidens a gift to the world. Cage Size: Birds should have a cage large enough to spread and flap their wings without hitting anything, include toys, at least 18 X 18 X 24 inches (45 X 45 X 60 cm) high. It is also important that the width in between each horizontal bar of the cage is 3/4" (2 cm) or less so that your bird can't stick its head through the bars and get hurt. The door should be large enough for your hand with the bird on it to fit through easily . The bird should not have to duck it's head down. Many companies make round cockatiel cages. These are not safe. Toes and beaks can get caught in the top of round cages where the bars all bend together to meet in the center. Black and white newspaper is the best covering for the bottom of the cage. Colored newsprint has lead in the ink, which is toxic to your bird. Some newspapers have switched to soy based inks, check with your to be sure. I recommend a water bottle for drinking, different size perches for its feet, and a terra cotta perch for its nails and beak. Clean the cage as often as your sense of good housekeeping dictates but at least once a week. Provide a cuttlebone, mineral block and toys for your bird to chew on. Cockatiels love to chew so watch your windowsills. Food: Your bird has been eating Hagen, a pelleted food, with vegetables greens, pastas, beans, seeds, rices, breads and fruits alternated daily. For freshness I suggest that you store seed in the freezer. Storage in the freezer will also cut down on the moths that love to nest in bird seed! Talking: Do not teach the bird to whistle. Cockatiels that have learned to whistle rarely become good talkers. Just keep repeating the same word or small phase to the bird until he repeats it. Keep in mind that birds will repeat words that are interesting to them. Many birds don't say hello because it is one tone, but love to say Hi! because it is high pitched and fun. Always offer a favorite food as a reward for any attempt at the beginning and then once he has started only when he does it right. Tricks: Your bird can learn to do many tricks. Work with the bird for short periods of time a few times each day. Teach the trick in stages and always offer a treat for each phase. Commands for tricks should include verbal and visual commands. For example, one of the first things your bird should is to "Step up." The verbal command is "step up," and the visual command is an extended finger near the breast of the bird. Potty Training: You can also potty train your bird. In this case, the verbal command is very important. Choose a word or phrase for the action like, "go stinky" or "potty" or whatever you feel comfortable with. The first step is to watch your bird and learn its body movements before it goes. Then, take it to where you want it to go, holding its tail down. Give the verbal command and a lot of praise if your bird does go. Allow the bird to resume its previous activity. If your bird makes a mistake, pick him up, saying firmly "no, bad bird" and take him to where he is supposed to go, giving the verbal command. Then, some sort of discipline is necessary, for example cage time for five minutes. The initial punishment should not be severe at all. Five minutes is adequate. As the training progresses however, a mistake should be punished with increasingly more time out. Your bird's wings should be clipped for it's own safety . It will still be able to fly enough to stop itself from falling but not enough to gain any height. One flight feather will allow your bird to gain height so keep it's wings clipped. Also a bird with clipped wings is a calmer and sweeter bird.